So far, one of my most favorite place to go tripping is Florida. If I'm not finding myself in Disneyworld, mostly that I am heading to the beach. I'm a tropical person, one major thing why I love Florida, weatherwise. 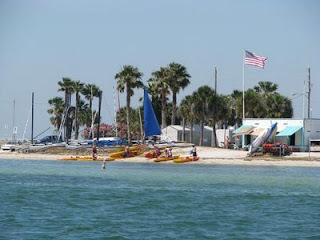 If I'm going beach bound, it might be good to try going to Florida's Gulf Coast, - Caladesi Island. Haven't been here yet, but if you want to get away from the bustling city, and want to see what Florida was like before condos, beach houses and commercial developments, here's the place. Caladesi Island State Park has 600-acres and only accessible by boat. Ferries leave from Dunedin's Honeymoon Island every hour, year round. Caladesi has beautiful white sand and it will be here that you will see why the beach is recognized as one of the best beaches in America. The downside of it is that visitors who arrive by ferry can stay on the island for only 4 hours, but you can plan to have a well-packed activities in this back-to-nature paradise. A swim in a clear gulf water is a good start, or take a stroll along the nature trails. Wow! How I wish I would be crossing this paradise island someday.